If age matters in whisky, just how far back might we go...? PITY the poor drinks-trade salesman, writes Rupert Patrick, CEO of both WhiskyInvestDirect and James Eadie. I once drank a claret from 1899, a Ducru-Beaucaillou. It was then 83 years old, and I remember thinking it was made in the year my grandfather was born. In wine terms it was incredibly old and – slightly surprisingly – very good. My career in wine switched to whisky, and then – twenty-six years later – I found myself digging further into the past, reading the whisky-trade ledgers of my grandfather's grandfather. These ledgers date from the 1870s, and they record the whiskies blended by James Eadie to make his Trade Mark "X" Scotch whisky. A few of the distilleries my great-great grandfather mentions have long since closed, but many of the names in his Victorian ledgers are familiar to today's whisky fans – Lagavulin, Glendronach, Talisker, Craigellachie, Caol Ila, Glenturret. Packed with such delicious malts, what did Eadie's Trade Mark "X" taste like, I wondered. What if his recipe was used today? More research, and we discovered that Alfred Barnard – Britain's most famous drinks-trade writer of the 19th Century – had visited Mr Eadie at his brewery in 1889. 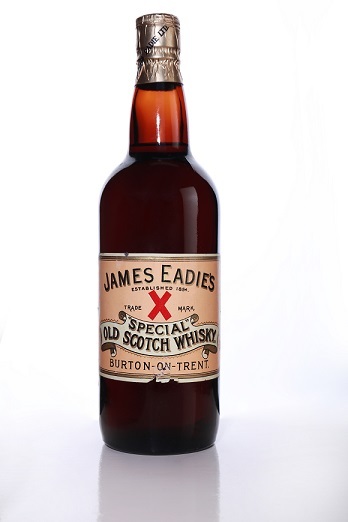 As well as writing up his excellent beer he also praised Mr Eadie's blended whisky: "An ancient Scotch mixture...dispensed to a favoured few." So, the blend might have been pretty good! A real pity then that it went out of production in the early 1940s. Eadie's brewing, blending and pub businesses had been sold to Bass in 1933, and both beer and whisky were going through tough times. The Great Depression and then WWII forced the shut-down of many once-famous brands. I'm not one for harking back to the 'good old days', but having tasted a very old wine – and having seen James Eadie's even older whisky ledgers – I was intrigued to find out how a Scotch blended 150 years ago might compare with today's premium brands. And then, at a family gathering, I discovered that there are in fact one or two bottles of Eadie's Trade Mark "X" still in existence. These bottles had been locked away, almost forgotten, by my uncle. He rather nonchalantly remembers it as a 'big, dour peaty blend', and like many of his generation had moved on to lighter blends like J&B and Cutty Sark. Today of course, single malts make all the headline news in whisky. Sales of Scotch malts have been growing at 6% a year worldwide by value so far this decade. But talk to the cognoscenti, and to some of the quieter, more contemplative members of our industry, and you'll hear more talk and discussion about blends, good and great, from yesteryear as well as today. The art of blending was created in the mid 19th Century and then honed in the latter part, allowing such famous brands as Johnnie Walker, Buchanan's and Dewar's to start building their global exports from the turn of the century. So how did Mr Eadie's Trade Mark "X" taste? Was it really a fine quality blend from the golden age of Scotch whisky? We know which whiskies he blended, we know the wood types he used for maturation, and we know the number of barrels of each grain and malt he bought and aged. With this information, and with a bottle of the 1940s version at our disposal for sampling, it became obvious that we could try to do a 'revival' of the original blend. Two big obstacles stood in our way. First, how would we ever get our hands on all those amazing malts, now treated like gold dust by their producers? Second, could we find a Master Blender willing and able to lend his or her skills to blending those malts and grains into an accurate revival of the original Trade Mark "X"? Norman Mathison has an amazing 50 years of blending experience. I've known Norman for half of those years, and his reputation in the trade is second to none. Starting at age 16 at Invergordon Distillers, he has amassed a lifetime of blending experience – now being put behind the James Eadie revival as Master Blender in what is a real coup. But we still needed to secure all the ingredients – and having started with the goal of re-creating the blend as closely as possible, I didn't want to leave out any of the malts and grains found in the ledgers which are still in production today. Endless phone calls, meetings, networking, persuading and negotiations followed. For a while I thought we might lose the battle, because the chance of acquiring all the right Islay and Campbeltown whiskies, never mind some of the sought after Speysides, was looking slim. I'm delighted to say however, that everyone I contacted in the Scotch industry has been incredibly positive, helpful and encouraging. The revival story piqued their interest, and so – cask by cask – we've managed to find all the whiskies we need. Read more in "Reviving Trade Mark "X": The Missing Whiskies".